On behalf of the Canadian Security Investigations Association (CSIA) and the Make-A-Wish Foundation of Toronto & Central Ontario, we would like to extend a very big thank you to you and your business CanadaLawnSigns.com. 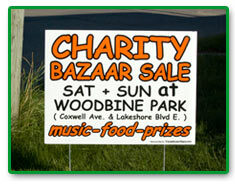 We contacted Canada Lawn Signs to place an order for 100 12"x16" signs to be used for a big charity bazaar sale we were hosting at Woodbine Park in Toronto benefitting the Make-A-Wish Foundation. The reason we contacted you was because we could not find any print shop in Toronto that can compete with your great prices! Amazingly, after less than 2 hours of contacting you by email, we got a response from you confirming our order. Only 6 days later, the signs arrived at our door and they looked great! It would take the same time if not longer to place the same order from a local Toronto print shop, but the CLS prices are unbeatable!. That said, we would most certainly come back to you for al our sign needs and are more than happy to refer anyone to CanadaLawnSigns.com. Thank you for your great service and for having an efficient, well run Canadian business. I am very pleased with the outcome of my order with your company and the quality of the signs received. My signage has been very successful for my company and I will be ordering in the future from you. I also have referred your business to other business associates who may benefit from your service. Thank you for being an honest Canadian business to deal with as it can be difficult at times not knowing the company you are dealing with and the service that they provide. You are a person of your word and it is much appreciated. 100 fabulous Canada Lawn Signs helped bring more than 1200 guests to the 3rd annual Oakridge Block Party this September! Even Quatchi, Miga & Sumi (Vancouver 2010 mascots) showed up! We chose Canada Lawn Signs as our business of choice in Vancouver because even with shipping costs included, our signs were one-quarter the price of local quotes. Thank you, Canada Lawn Signs, for helping making our community festival such a success! Love the quick and helpful service we got from CanadaLawnSLove the quick and helpful service we got from CanadaLawnSigns.com - our signs have generated huge amounts of traffic to our business and they're so easy to put out. The comments we have received from our clients about our signs has been only positive and encouraging. It's never been so easy to advertise. We give CanadaLawnSigns two thumbs up! 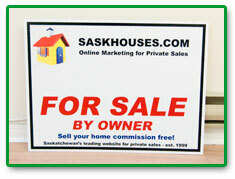 "igns.com - our signs have generated huge amounts of traffic to our business and they're so easy to put out. The comments we have received from our clients about our signs has been only positive and encouraging. It's never been so easy to advertise. We give CanadaLawnSigns two thumbs up!" David, I wanted to write a quick letter of thanks for your exceptional customer service, and fantastic product. We ordered 50 of the 16"x24" signs, and are very pleased with the results. The artwork turned out great, and we are impressed with the quality, and the product itself. In addition to a great product, your company was very easy to deal with. The online order form was easy to use, and the quick response to my request was wonderful. Within a few hours, I had all the information required, and we were working on getting the artwork done. You also made great suggestions on the design of our signs, offering a couple of different design choices for us to select from. Once we had made a decision, the order was processed very quickly, and it was delivered as promised, on time. I would definately recommend your company to anyone who is looking for a great looking product, quick turnaround and very competitive pricing. 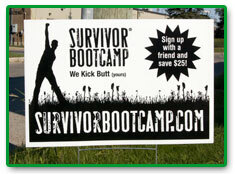 We will be using your company again whenever we have need for additional signs to promote our company image. Thank you again for your assistance. 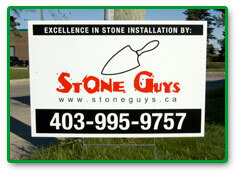 Gloria Wing, Director of Operations, Stone Guys Ltd.
Canada Lawn Signs have produced for us an excellent product. David and his team assisted in the design process to ensure the message we wanted to send was the one our audience recieves. Once we committed to the order we recieved what we were looking for quickly and with a very high quality. I am looking forward to ordering more to market our organization. I wanted to write to thank you for your exceptionally quick turnaround time for our latest order (that included our unrealistic expectations). You made us look good to our customer!! You corrected an issue in question, in the most professional of manner...whatever the reason or wherever the fault lies. I am known for "being hard" on our suppliers, but I also acknowledge exceptional performance. You and your team provide us with the best prices (we have checked across Canada) and great delivery. 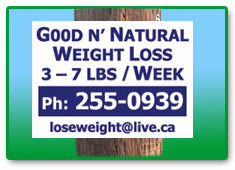 I have been dealing with Canada Lawn Signs for just 4 months and I have received very good services. They always try hard to satisfy their clients. 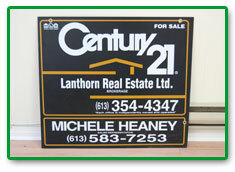 I can recommend you to do business with Canada Lawn Signs. It is a company with a big heart. My business was just launched in the fall of 2009. 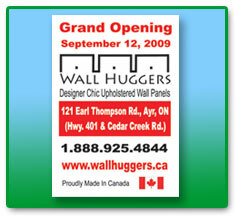 I have placed two orders for coroplast signs with Canada Lawn Signs. The quality, price, service and delivery have been excellent. Thank you, Canada Lawn Signs! We were extremely happy with your service for the field signs we ordered. Your prices were very competitive and you offered very, fast and helpful service. Thanks! Thank you Canada Lawn Signs! Using your service is saving us hundreds of dollars every month. The quality of your signs is second-to-none, and you even helped improve the design of our signs. Ordering was quick and easy, and the signs were delivered right to our door!" I have ordered lawn and other coroplast signs four or five times over the last 6 months. Pricing has been competitive, workmanship great and staff friendly. They give me a good product at a fair price. I continue to give them my business. Thanks so much for the signs. They look great!!. Thanks David - I really appreciate the quick turnaround.